It’s not necessary that you have a local development environment in order to have a good web site. You could edit files directly on the server or have your editor set up to automatically transfer changes to the server once you change and save them. However, there are lots of benefits of running a local server. You can try out things offline without Internet connection. You can try out things freely and can make mistakes without showing up on the live site. You can make mistakes without losing data or rendering the site unavailable. You can learn a new content management system (CMS) such as WordPress, Joomla, and Drupal without spending any money on web hosting. Installing a local server was a painful and confusing process on Windows and Mac operating systems in the past (Unix or Linux always came with a server), nowadays the process has become a lot easier. There are many web server solution stack packages such as WAMP, LAMP, MAMP, XAMPP, and AMPPS. Each software solution package is made for a particular operating system. MAMP for Mac, WAMP for Windows, and LAMP for Linux. XAMPP is a free, open source cross platform web server solution stack package for Windows, Mac, and Linux. 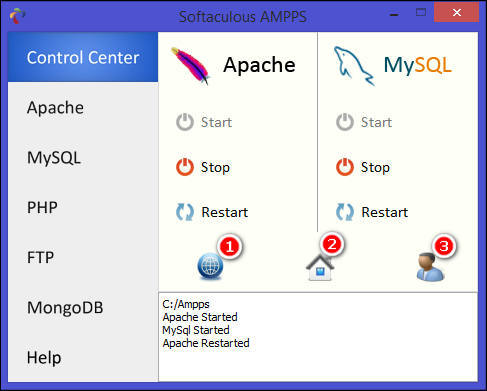 AMPPS is a software stack from Softaculous enabling Apache, MySQL, MongoDB, PHP, Perl, Python, and Softaculous auto-installer on a desktop. It has more than just Apache, MySQL, PHP. If your job requires a variety of development environments then you require a tool which concentrates on the solutions rather than development environment. AMPPS is packed with MongoDB, Perl, Python, and RockMongo to cater wider tech needs and preferences. 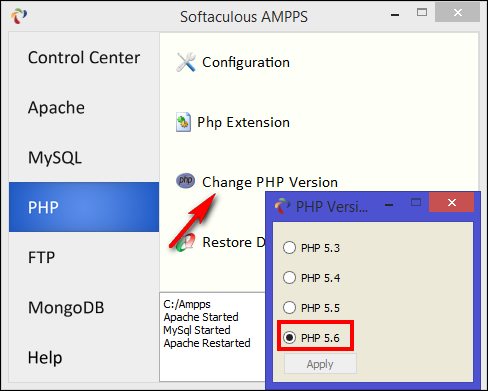 AMPPS comes with Softaculous that allows us to install web applications in the shortest way possible with the installer. At the time of this writing, there are more than 350 web applications that can be installed through Softaculous. The auto-installer makes the process of installing apps much easier and hassle free. Everything from copying the files to creating a database is done by Softaculous. 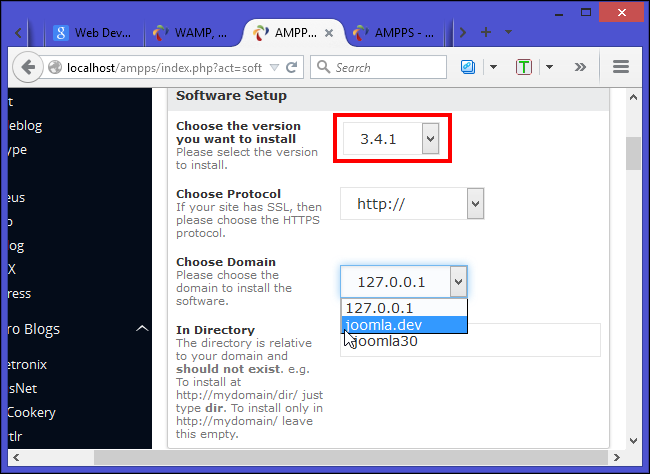 The “AMPPS Home” interface is similar to Softaculous. On the left side, you’ll find various categories of scripts ranging from Blogs, Portals/CMS, and Micro Blogs to Forums, Wikis, and more. On the right side, you’ll notice a configuration panel for adding and managing domains, database tools, Apache, PHP configuration, and so on. 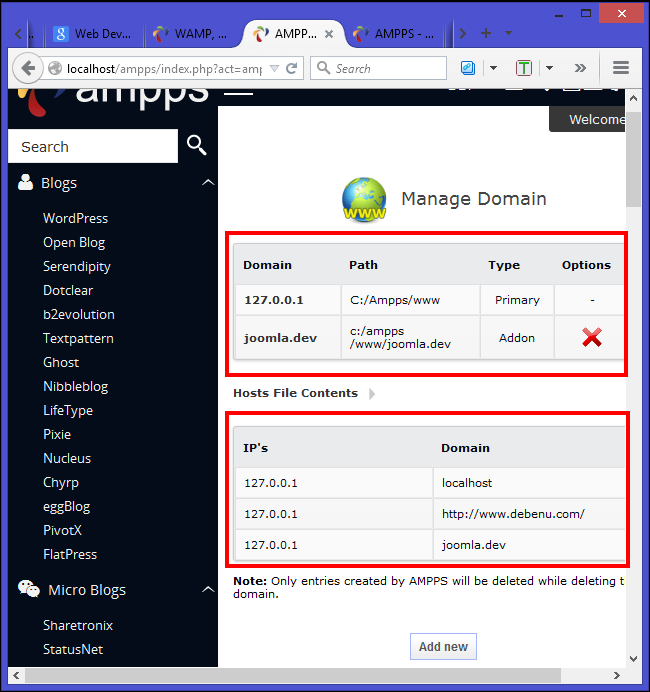 The “AMPPS Admin” page gives you an overview of AMPPS settings (general settings, user based panel settings, detailed information, and error logs) and allow you change them according to your needs. For example — you can disable end user news of various scripts or turn off script ratings and screenshots from AMPPS dashboard. Click the “Add Domain” icon and let’s name it as “joomla.dev.” Select the “Add an entry to Host File” to register the domain name into the host’s file. Upon clicking the “Add Domain,” you will be prompted with your administrator credentials, username, and password as it attempts to write the host’s file. At this point, we are done adding the domain name. Click the “Manage Domain” icon to see all the domains you have added. 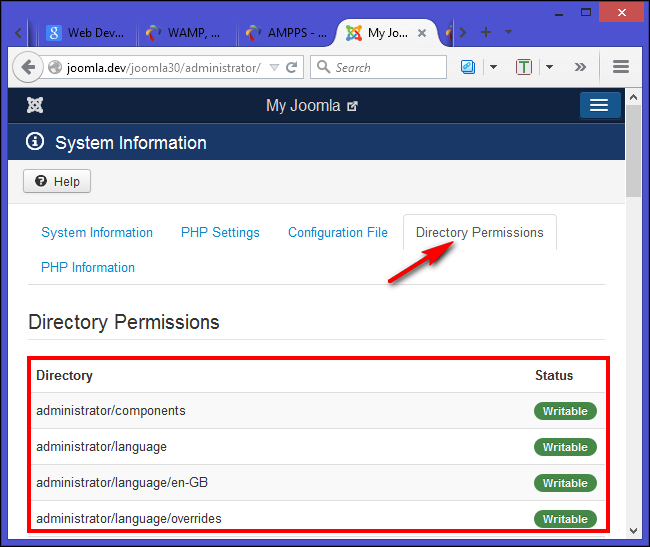 In the screenshot you’ll notice that “joomla.dev” domain is in the list as well as in the host’s file. This ensures that your domain indeed make an entry to the host’s file and further on there will be no errors. If you want to delete the domain click the “red cross sign” (X) as shown in the screenshot. On the left side you’ll find various categories of scripts. Click on “Portals/CMS” and then on “Joomla.” The script details page will appear which will show you the version of Joomla available along with other details like ratings, reviews, demo, and more. Click on the blue “Install” button from this page. In “Site Settings” write your site name along with a description. The “Database Settings” is pre-filled with information so you don’t have to make any changes. Ensure that you leave “Import Sample Data” to None. In “Admin Account” fill in the appropriate username and password field and select your default language. Finally, click on the “Install” button located at the bottom of the page. 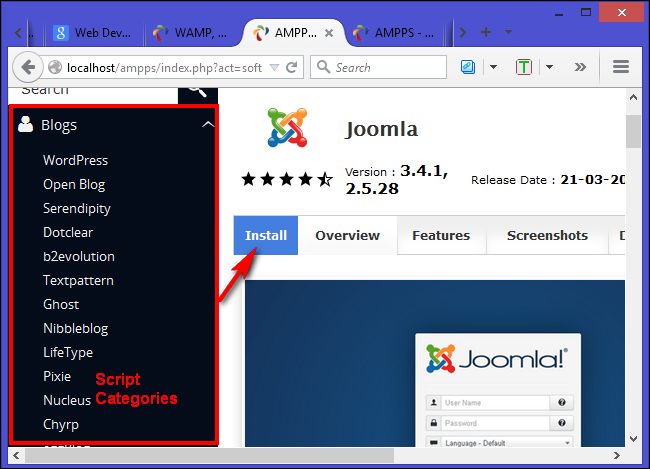 AMPPS will download the latest package from the Joomla repository and install it automatically. Once installed, you’ll see a message that your software is successfully installed. You’ll get a URL where Joomla is installed along with its administrator URL. Now open the URLs in different tabs and bookmark them. Although your installation is successfully completed, there are few more things to check. Head over to technical requirements of joomla and note down the version requirement of PHP, MySQL, and Apache. AMPPS always comes with latest solution software package, so you don’t have to work with old and unsupported package. Still it is highly recommended to work with the latest version of Apache, MySQL, and PHP. 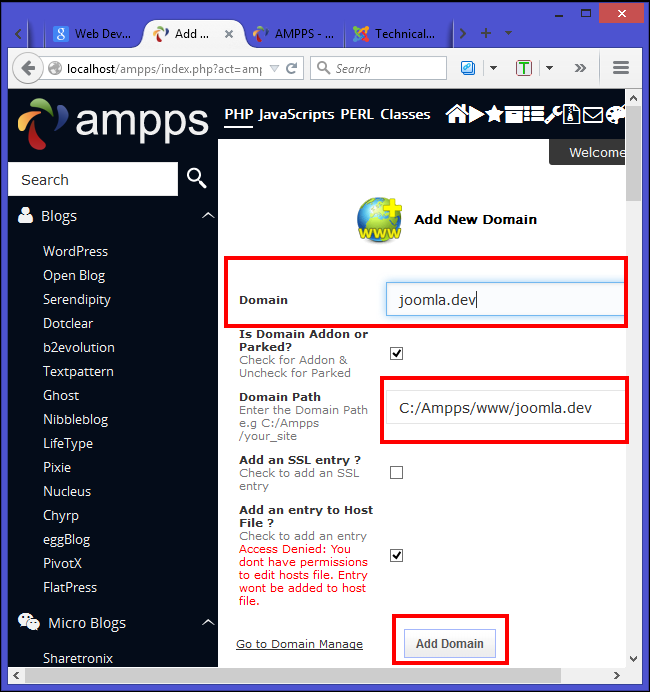 The installation process of Joomla through AMPPS is fairly simple since we don’t have to deal with any configuration or troubleshooting. We don’t even need to create a database. If you have any questions or have method you want to share, let us know in the comments section below.